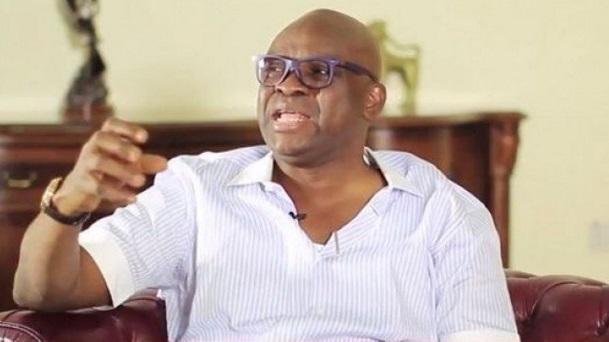 The Ekiti State governor, Mr Ayodele Fayose has lamented the alleged destruction of the Legislative and Judicial arms of government by the government of President Muhammadu Buhari, raising the alarm that “democracy in Nigeria is under serious threat, with the constitution appearing to have been suspended”. Fayose described the Senate President, Bukola Saraki as the most subdued National Assembly leader in the history of Nigeria, saying; “Should President Buhari succeeds with his second term bid, no one should bother going to the National Assembly because he will rule like a feudal lord, with general authority over other Nigerians. “Democracy is endangered when the executive arm of government goes about demonizing the Judiciary as being corrupt and the National Assembly tagged as a gathering of rascals who are contributing nothing to governance. Unfortunately, that is what the Legislative and Judicial arms have suffered under this government. “In disobedience to court order that they should be released, the leader of Islamic Movement in Nigeria, Sheikh Ibrahim Zakzaky, and his wife, Zeenat, have been detained for more than two years without trial. “Also, Col. Sambo Dasuki (rtd) has been in detention for over two years even when many courts in Nigeria and the ECOWAS Court have ordered for his release. “Several resolutions made by the National Assembly have been ignored, including ones bothering on the welfare of Nigerians. Statutory appointments that require Senate confirmation are now being made unilaterally. Even those whose nominations were rejected by the Senate are still holding the same offices for which their nominations were rejected. “Lovers of democracy in Nigeria should therefore be worried and the international community must intervene and prevail on the President tocttctct allow democratic institutions to function in the country,” the governor said.